On modern systems, dynamic shadows (High, Very High) are only rendered on part of the screen. Precise cause remains unclear. SLI (more than one graphics card) is not supported and causes a black anomaly to fill the screen, disable SLI to remedy. SecuROM 4 DRM disc check. Expansions use SecuROM 5 DRM. The 2007 JoWood-published 'Spellforce Universe' (red box) requires CD Key only, no disc check. Russian copies use StarForce DRM. Go to videos in the installation folder. Delete or rename prelude_0.bik, prelude_1.bik, prelude_2.bik and prelude_3.bik. Use -window command line argument. The game supports no native widescreen. There are two workarounds, one better than the other. Download the Spellforce .exe archive from WSFG. Paste and overwrite the .exe corresponding to your resolution into the installation folder. 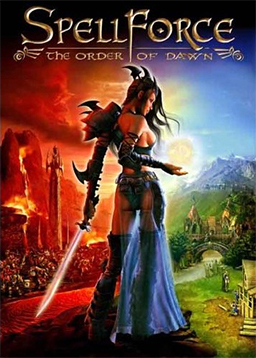 The game will now play in widescreen. 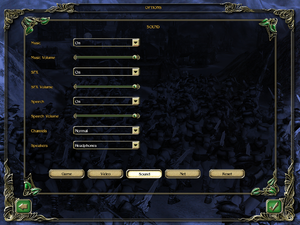 Right click on SpellForce.exe in the installation folder and choose Properties. Go to the Compatibility tab and choose Run this program as an administrator. This fix however produces a series of graphical errors. Only available in Polish retail release. Only available in Russian retail release. Only available in Spanish retail release. Co-op supports up to 3 players. 8 GameSpy server browser has been shut down. 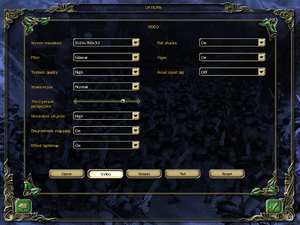 Right-click on game executable (or shortcut) and select Run as administrator. Enter the key, and after that the game will no longer prompt for the key every time it's launched (even if not running as administrator). Draw-distance can be increased beyond the in-game maximum in the config.lua, at the cost of performance drops. GameSpy GameSpy server browser has been shut down. ↑ 2.0 2.1 File/folder structure within this directory reflects the path(s) listed for Windows and/or Steam game data (use Wine regedit to access Windows registry paths). Games with Steam Cloud support may store data in ~/.steam/steam/userdata/<user-id>/39540/ in addition to or instead of this directory. The app ID (39540) may differ in some cases. Treat backslashes as forward slashes. See the glossary page for details.